Stunned myocardium is a rare, but serious, medical condition, and requires emergency intervention. Short periods of hypoperfusion may lead to a prolonged cardiac hypokinesia (hours to days), even though the perfusion is retained eventually. In other words, although the coronary circulation is retained, the hypokinesia remains. It might be considered as a case of prolonged post-ischaemic dysfunction. In this case, a 60-year-old woman, visiting her siblings, presented with severe dyspnoea and cyanosis to the emergency department. Pulmonary oedema was diagnosed, and transthoracic echocardiography (TTE) showed general hypokinesia and reduced ejection fraction (15%), nevertheless, sequential TTE monitoring after the required medical intervention revealed a continuous improvement, with a 45% ejection fraction three days later and a specific anterior wall hypokinesia, solely. In conclusion, rapid diagnosis and treatment are essential for stunned myocardium, as these could change the progress of the clinical condition. A 60-year-old, nonsmoking, white woman presented with a severe dyspnoea and cyanosis to the emergency department. The woman was visiting her siblings when a sudden dyspnoea evolved; patient history showed that the woman had hypertension treated orally for 10 years (treated with perindopril 4 mg and bisoprolol 5 mg) and recently diagnosed diabetes (not treated). The patient neglected any chest/epigastric discomfort or pain, no recent cough or sputum, no history of anginal pain or orthopnoea. No history of recent psychological or emotional stress. Inspection revealed a respiratory rate of 40, the patient was alert and conscious with Glasgow Coma Scale (GCS)=15, and severe cyanosis. Examination revealed a blood pressure of 180/100 mmHg, O2 saturation of 60% (83% with O2 10 L/min), pulse 133 bpm, basal bilateral fine crackles, no wheezing or localised coarse crackles, no deep vein thrombosis (DVT) signs. Results of further investigations are shown in table 1. The patient was admitted to the critical care unit (CCU), and placed on a respiratory support machine (CPAP) with fraction of inspired oxygen (FiO2)=100%. The patient received nitroglycerine, furosemide 120 mg and 5000 IU heparin was given intravenously. Oral aspirin 81 mg, clopidogrel 75 mg and atorvastatin 40 mg were also prescribed. The patient’s respiratory rate dropped to 25 per minute with blood oxygen saturation (SpO2)=97%, however, blood pressure dropped to 90/60 mmHg and dobutamine was initiated at a 7 µg/kg/minute dosage, and the patient’s urine output was estimated to be 300 ml per hour. 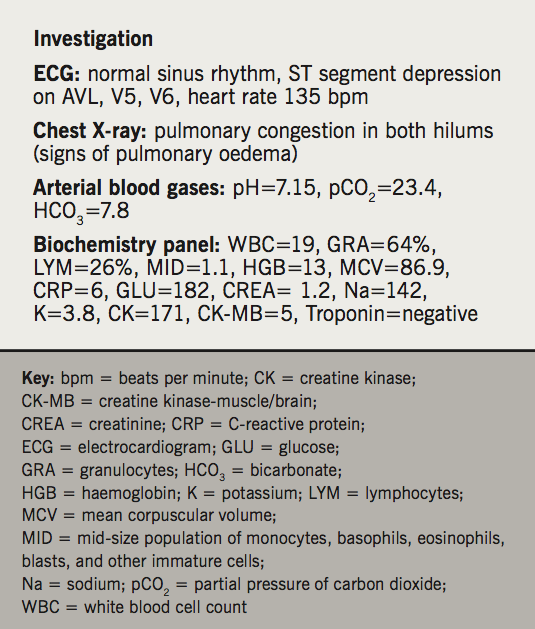 Another arterial blood gas sample was taken after 30 minutes of admission: pH=7.33, partial pressure of carbon dioxide (pCO2)=38, bicarbonate (HCO3)=22.8, SpO2=99, potassium (K)=3.8, sodium (Na)=140. Troponin was negative 6–12 and 24 hours after admission. A second ECG showed heart rate improvement from 135 to 88 bpm, and T-wave inversion on lead I, AVL. Emergency transthoracic echocardiograph (TTE) showed a 15% ejection fraction, with severe generalised hypokinesia and significant increase in end-diastolic pressure, no apical ballooning or hyperdynamic base (generalised hypokinesis). After 15 hours, the patient was stable and the respiratory support and dobutamine was ceased and the patient was haemodynamically stable. Blood pressure was 105/65 mmHg (without inotropes), respiration rate 20 per minute, SpO2=95% (3 L/minute nasal spike), troponin was negative and thyroid function tests (TFTs) were within the normal range. TTE was performed two days after remission: ejection fraction was 40–45%, there was isolated hypokinesia on the anterior wall, with improvement on the other cardiac walls’ motility, and reduced end-diastolic pressure. The patient was referred to an interventional cardiologist three days later; angiography revealed a 95% stenosis on the proximal segment of the left anterior descending (LAD) artery, and a stent was placed. Follow-up: TTE was performed 35 days later and showed improvement in contractility with an ejection fraction of 55%. Damage of membranes and enzymes by free radicals. Stunning requires no therapy at all, since blood flow is retained to normal, and contractile function will recover spontaneously. If, however, myocardial stunning is severe, involving large parts of the left ventricle, and, thus, impairs global left ventricular function, it can be reversed with inotropic agents and procedures.1 Also, the emergent management of the consequences of stunned myocardium is crucial, such as pulmonary oedema. This case indicates that some patients who appear to have massive and terminal left ventricular dysfunction may, instead, have large amounts of reversibly stunned myocardium. Mechanical support with left ventricular pharmacologic support by infusion of catecholamines, can sustain life, while the severe myocardial stunning gradually degrades and the left ventricle resumes its contractile function. 6. Heusch G. Hibernation, stunning, ischemic preconditioning – new paradigms in coronary disease. Z Kardiol 1992;81:596–609. 7. Schulz R, Heusch G. Pathophysiology of the “hibernating” myocardium. Z Kardiol 1995;84(suppl 4):91–100.